Auf der Grundlage des preisgekrönten SWiF-Designs bringt die neue SWiF2 Serie leistungsstarker und leiser Lüfter die bewährten Qualitäten seines erfolgreichen Vorgängers einen Schritt voran - durch die Ausstattung mit hydrodynamsichen Gleitlagern sowie einem einzigartigen, aufregenden Farbschema. The new hydro-dynamic bearing ensures whisper quiet operation and even better longevity, which is backed up with a massive 60 months warranty. 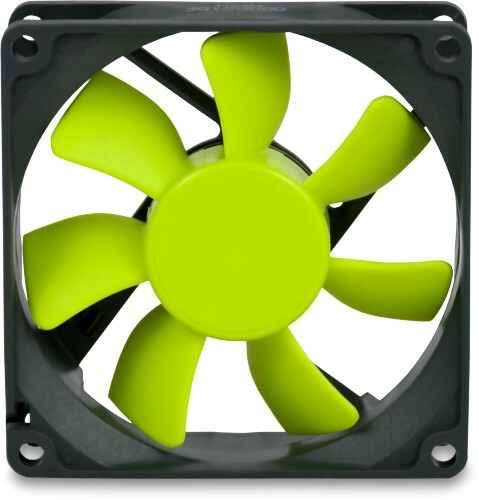 No matter where in your system you plan to install these fans, you can be sure the SWiF2 series provide an exceptional noise to performance ratio that you would expect from Coolink. very quiet. just what i needed. i put 4 of these fans in a radiator heat deflector cowling and they are not audible at all from 400mm away. I recently bought 4 of these to replace the standard fans in a 12 year old Lian-Li case. The ageing (cheap) fans were starting to make my computer sound like a Harrier Jump Jet. By comparison, these fans are nearly silent. Even with 4 of them running (1 at the rear of the case, 1 at the top and 2 at the frond to cool air flow over hard drives) there's very little noise (other than the PSU and CPU fans). For such a low price I'm amazed! The bright colour of the rotating section did raise my eyebrows but this isn't a problem with they're mounted out of sight. In summary, they're cheap and quiet. Hard to not recommend them. Bought these Fans to fit into my new Silver stone Case (ML03), these fans helped to bring the Temp down by 5-8 Degrees. They are so quiet that I can only hear them when I have my ear about an inch away from then, and this is just the air flow. I have just received and fitted two Swif2 800 for an audio amplifier cooling application and they are incredibly silent, what a great product also fast and helpful advice from Andy at Quiet PC. I bought x2 Noctua NF-R8 80mm fans (because I had used them before and knew they were quiet) but I also bought one of these for my HTPC case as it claimed to produce only 9dB. I was extremely surprised at this product, and actually prefer it to my other Noctua fans, even at full throttle you can't hear anything! not even the air! OK so it doesn't spin as fast as the Noctua so it won't move as much air, but it does shift plenty for something that makes no noise at all!